(Inside cover) The dog on this week's cover is Blind of Arden, who won the No. 1 U.S. retriever stake of the year on Nov. 21, had his picture taken at Southampton by LIFE photographer George Karger. A stylish black labrador, with a lsy arrogance about him, Blind is now 4, has been trained for hunting ever since he could stumble into the field. He lives on the big estate of his owner, W. Averell Harriman, near Tuxedo, N.Y., where he practices on live pheasants for half an hour each day with his handler, Jasper Briggs. Click on the thumbnail to see the original article text or read below. To Southampton, L. I., Nov. 20 came 22 of the best U.S. retrieving dogs for their No. 1 test of the year -- the open all-age stake of the Long Island Retriever Club. For two days the dogs fetched pheasant shot in the field and duck shot over water. 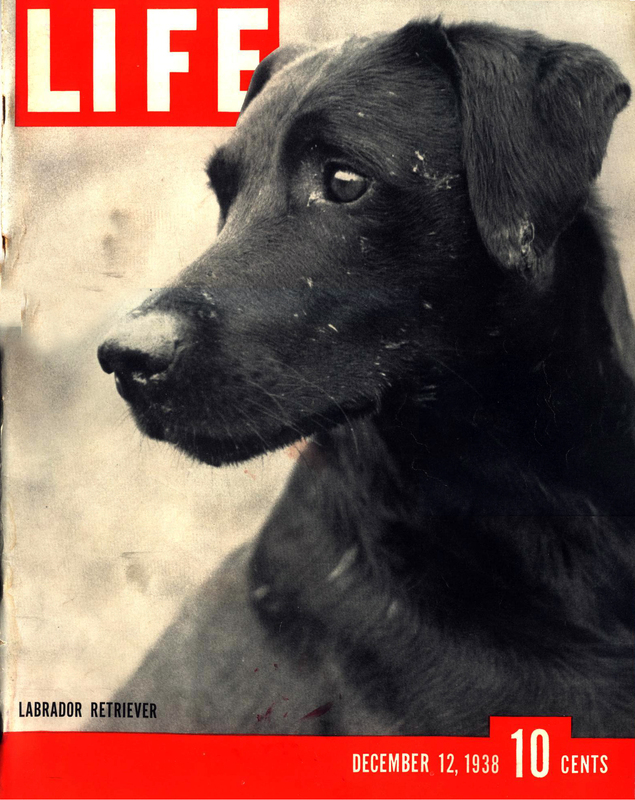 Long before the end of the tests, it was evident that W. Averell Harriman's Labrador, Blind of Arden was the best in the filed for 1938. Working without a mistake, this picture retriever capped a great performance with a remarkable blind recovery. For this event, a dead duck, unseen by the dogs, was planted on an island. At signal from his handler, Blind jumped into the water and swam to the island. There he scented the bird, looked back only twice to the handler, who with his arm waved him in the right direction. Quickly finding the duck, blind picked it up with a firm mouth, started swimming back to his handler. Then, after delivering bird, he sat stylishly on his haunches. This, however, was pure showmanship, and the judges were instructed to pay no attention to it. A marvelously intelligent, stocky dog, always friendly with children and the favorite of lady spectators at the trial, the jet-black Labrador has become popular in the U.S. only in the last ten years. Originally a breed of hunting dogs in Newfoundland, they were imported into England by fisherman during the early 19th Century. Because of English ignorance of New World geography, they were called "Labradors," were brought to the U.S. under that name. In 1933 they were officially registered by the American Kennel Club. At the trial. Blind of Arden, carrying a duck, comes dripping from water. 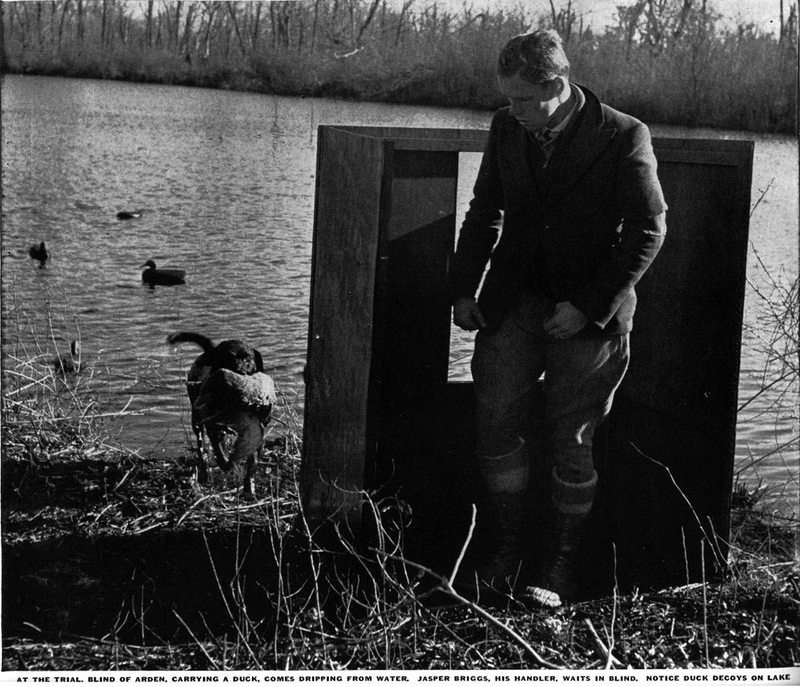 Jasper Briggs, his handler, waits in blind. Notice nearby duck decoys on lake. Across Southhampton scrubland, on the late Colonel Henry Huddleston Rogers' Port o' MIssing Men estate, trudge owners, handlers, spectators to the field where the land trials were held. To events like this, pheasant and duck are carted in crates, released and then shot in full view of the dogs. Later the dead birds are officially marked and sold. 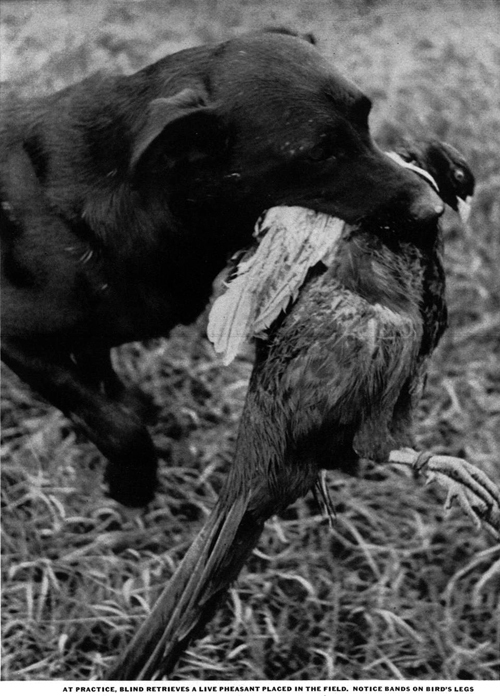 At practice, Blind retrives a live pheasant placed in the field. Notice bands on bird's legs. (Left) The handler controls dog by blowing whistle, pointing where bird has fallen. (Center) Three popular retrivers are, left to right, a curly coated retriever, a Labrador, and a Chesapeake Bay. With great condescension they watch their rivals perform. (Right) The retrieved bird is inspected by Judges Lawrence and Roesler. Dogs must not tear the skin or crush the body.